SignalVNoise announced their exit from Medium – they switched back to a custom and self hosted WordPress blog. These are just two businesses announcing their exit from Medium that recently showed up in my feed. A search on Twitter for #medium and #wordpress tells me the discussion about Medium vs WordPress is heating up again. (That is maybe also due to many new year resolutions being “start a blog”). 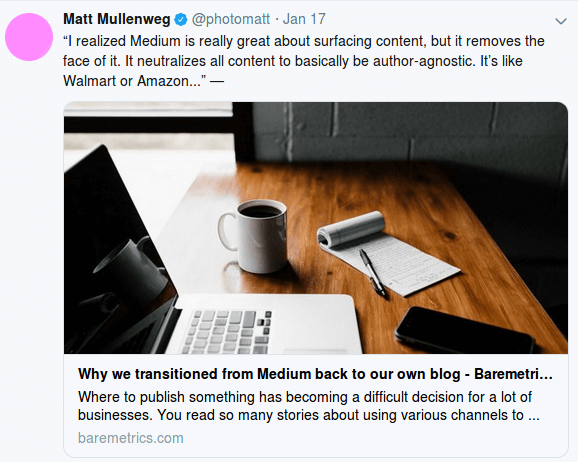 But what makes businesses second guessing their decision to host their blog on Medium? If you want your big ideas and important stories to be accessible to anyone with an internet connection and a web browser you have to be careful. Medium rejected the ad model and has to find other ways to make money. Which brings us to the changes Medium made to its site in the last 2 years. The site launched a subscription model (5$ month / 50$ year) and degraded the reading experience for free users. They promoted the membership model and pushed members-only articles. That brought also changes to its user interface: a pop up reminding readers to sign up for an account after reading more then 3 articles. As a writer, you want the reading experience to be friction-less. One more tiny but important detail: It is no longer possible to set up a custom domain. All blogs on Medium have the same URL structure. That is bad news for marketing your blog. In both cases, you can also go with WordPress.com (it lacks the social networking / community features of Medium), which allows easy transition to a self-hosted WordPress blog later on. The business model on WordPress.com is different: You can pay for gimmicks like custom domain, making your site ad-free or getting premium themes. It will be interesting to see if “exiting Medium” is turning into a trend, and how Medium will adapt its business model.